OncoQuest’s IgG and IgE Technology :: OncoQuest Inc.
OncoQuest has two IgG antigen-specific antibodies in the clinic and our second-generation IgE antibodies are in the preclinical stage of development. Unlike the IgG antibodies which do not have antibody-dependent cell-mediated cytotoxicity, not only do IgE antibodies induce a potent T-cell response, but they also sensitize IgE effector cells to directly attack cancer cells and modify the associated solid tumor stroma. Most therapeutic antibodies are used as targeted drugs. They work by attaching themselves to a particular target e.g. VEGF, HER2, CD20 and block the cells from receiving growth signals. By blocking the signals, these antibodies can slow or stop the growth of the cancer. They are developed most often on receptor-ligand interactions and pharmacological dose response necessitates high administered doses based on molecular weight. The immune system is carefully regulated to protect the body from foreign invaders, including bacteria, viruses, fungi, toxins, parasites, and tumors, while avoiding autoimmune diseases and destruction of the unborn fetus. Immune system protection from tumors is well documented, and functions primarily to prevent the development of tumors through a process called immune surveillance and to destroy, or reject, tumors once they have developed. The very fact that a patient has a tumor means that the immune system has failed in this important function. A cancer continues to grow because the immune system has developed a passive relationship with the tumor that is referred to as “tolerance”. This state of tolerance is complex and may have one or more different mechanisms. There is good scientific evidence that this state of tolerance can be overcome and that the immune system can be stimulated to destroy the cancer. Oregovomab is designed to stimulate the immune system to destroy cancers by a unique mechanism. To understand how oregovomab works, an understanding is needed of how the immune system is regulated and of the mechanism of tolerance. Immune responses fall into two categories, namely humoral (or antibody) responses, and cellular responses. Antibodies are made by B cells and are important in the protection from bacteria, viruses, and toxins, while cellular responses are mediated by T cells and macrophages, and are important in the protection from fungi, some viruses, parasites, and tumors. Both humoral and cellular immune responses are regulated by T cells. 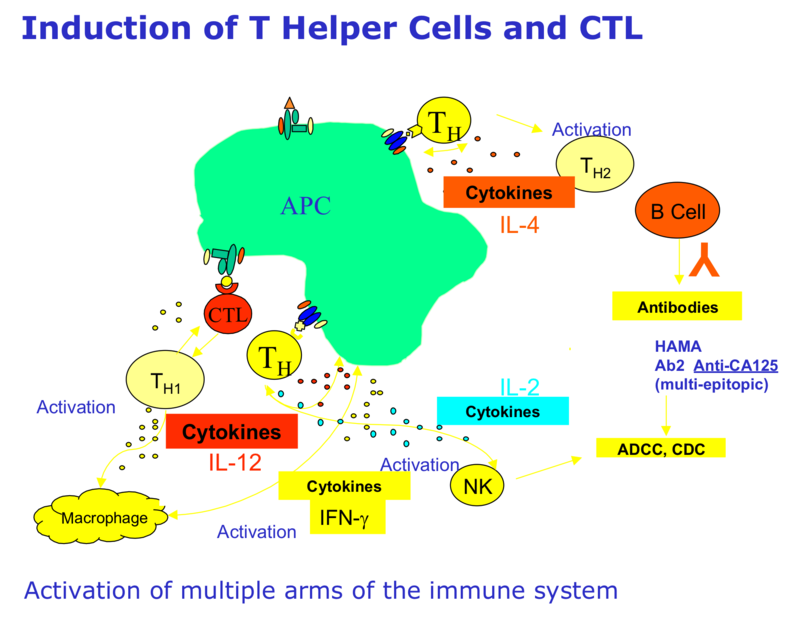 To initiate an immune response, T helper cells must be activated. This happens when the antigen is taken up and processed by what are referred to as antigen presenting cells. Several types of cells can function as antigen presenting cells, the most important of which are macrophages and dendritic cells. These cells take the antigen into specialized compartments within the cytoplasm, partially digest it with enzymes, and present small fragments of the antigen on the surface of the cell. These fragments are associated with specialized cell surface structures called MHC (Major Histocompatibility Complex) antigens. T cells have specialized receptors (T cell receptors) on them that recognize the combination of antigen fragment and MHC antigen. The activation of the T cell requires two types of signals. The first type of signal occurs when cell-surface molecules on the Antigen Processing Cell (APC) and the T cell interact physically. 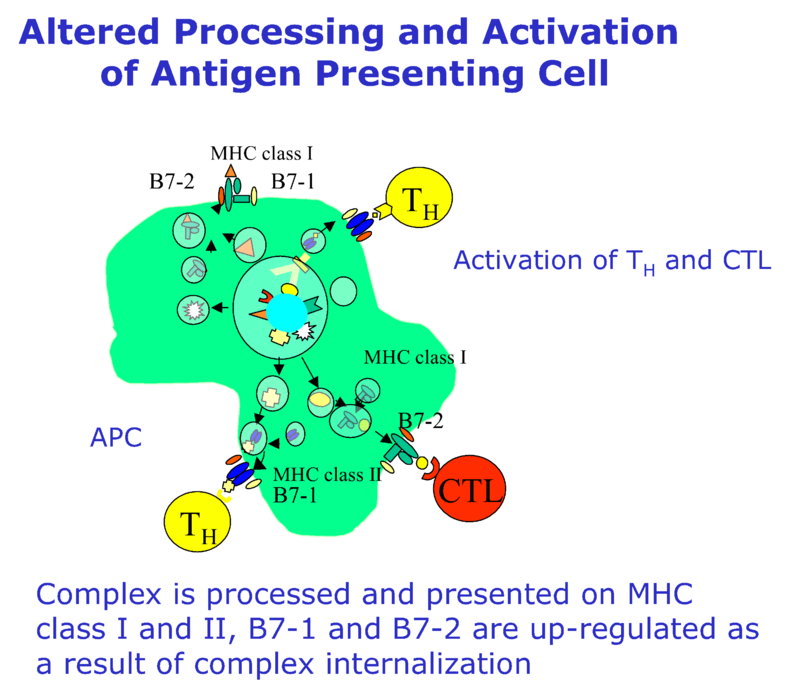 These interactions include the T cell receptor interacting with the antigen fragment-MHC antigen complex on the antigen presenting cell, CD8 or CD4 on the T cell interacting with the MHC Class I or Class II molecules on the APC, and co-stimulatory molecules (“danger signals’) such as CD28 on the T cell interacting with B7 on the APC, among others. The interaction of the antigen presenting cells and T cells induces the secretion of the second set of signals in the form of small protein molecules called a cytokines, or lymphokines, including IL-1, IL-12, IL-4, Tumor necrosis factor-alpha, and others. Once this happens, the T cell is activated to produce a variety of additional cytokines and to undergo a number of cell divisions. Over a few days, the T cells mature into T helper cells which cause B cells to make IgG antibodies or cause macrophages and killer T cells to become activated and capable of killing cells infected with viruses or cancer cells. If, on the other hand, the T cell receptor interacts with antigen fragment-MHC antigen complex on an antigen presenting cell, but no co-stimulatory “danger signals” molecules are present, or none of the activating cytokines are made at the same time, then the T cell is not activated. Rather, the T cell becomes paralyzed and may actually die. In either case, no immune response is observed because no antibody or T killer cells can be measured. The absence of a measurable immune response is called “tolerance”. This state of tolerance can occur for several reasons, including having too little or too much antigen in the system. Ovarian cancers frequently make a large amount of a specialized antigen, CA-125, which is thought to decrease the activation of T helper cells because either there is too much of it in the system, it cannot be processed by antigen-presenting cells, or it does not induce costimulatory danger signals. Oregovomab is a murine monoclonal antibody that is specific for CA-125. When oregovomab is injected intravenously at low doses into a patient, the antibody binds to circulating CA-125. 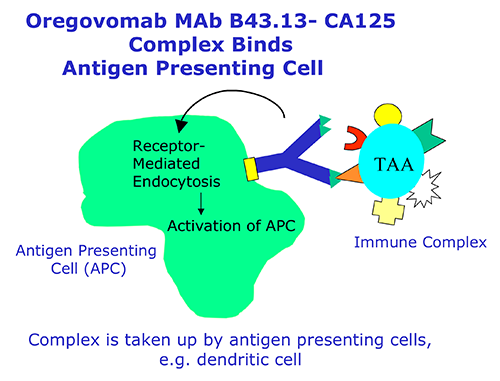 Complexes are formed between the antibody and the CA-125 antigen (antigen-antibody complexes). These complexes are taken up by antigen presenting cells and at the same time, decrease the amount of CA-125 in the circulation. It is thought that the antigen-antibody complexes enhance the ability of the antigen presenting cells to present fragments of the CA-125 antigen on the surface of the cell and activate the antigen presenting cells to make co-stimulatory cell-surface molecules and cytokines. 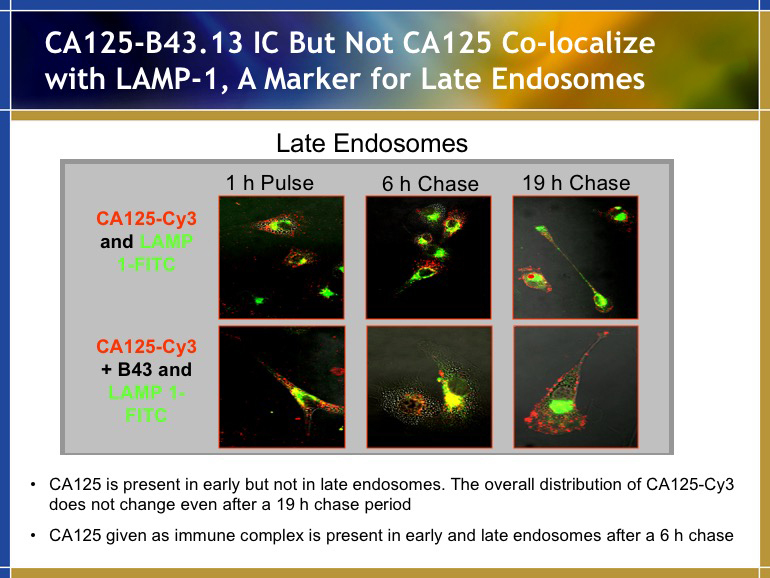 The combination of decreased amounts of CA-125 in the circulation and the enhanced presentation of CA-125 on activated antigen presenting cells results in a more efficient stimulation and activation of T helper cells. This would then result in a measurable immune response to CA-125 and the apparent reversal of “tolerance”. In the classical understanding of antigen-presentation major histocompatibility complex (MHC) class I molecules are complexed exclusively with peptides derived from cytosolic antigens, whereas extracellular antigens are processed and presented on MHC class II molecules. However, exogenous antigen transfer to MHC class I molecules (also referred to as cross-priming) is necessary to prime naïve CD8+ T cells and to induce cytotoxic lymphocyte (CTL) responses. Results from completed studies suggest that dendritic cells may play a critical role in this process. Cognate CD4+ T cell help is also required for efficient CD8+ T cell activation with antigen recognition by both CD4+ and CD8+ T cells on the same dendritic cells. Therefore, simultaneous presentation of peptides from exogenous antigens on both MHC class I and II molecules is required. Presentation of peptides derived from exogenous antigens on MHC class I molecules may occur through two different pathways. First, internalized antigens may exit endocytic compartments and, once in the cytosol, may be processed by the proteasome and reach the conventional transporter associated with antigen (TAP1/2)-dependent MHC class I antigen presentation pathway. Alternatively, internalized antigens may be processed in endocytic compartments, generating peptides, which associate with pre-existing MHC class I molecules in endosomes or at the cell surface. Regardless of the pathway, cross priming after fluid phase antigen internalization is very inefficient and requires high antigen concentrations that cannot be reached in vivo. Antigen-uptake via phagocytosis strongly enhances MHC I presentation in macrophages and dendritic cells. Thus, the pathway by which antigens are internalized may influence their outcome on MHC molecules. Efficient MHC class I and II-restricted presentation of peptides from exogenous antigens can occur if they are taken up in complex with specific antibodies. Macrophages and, in particular, dendritic cells express several receptors for the Fc portion of immunoglobulins (FcR) which mediate internalization of antigen-IgG complexes (immune complexes, ICs). Large amounts of FcR (CD32 and CD64) and complement receptors are present on monocytes and immature dendritic cells, but decrease with maturation of dendritic cells. Several groups have found that specific antibodies enhance the uptake of antigen in immature dendritic cells (Sallusto et al., J Exp Med (1994) 179:1109; Esposito-Farese et al., J Immunol (1995) 154:1725; Larsson et al., Immunology (1997) 90:138). Dendritic cells also express mannose receptors that can internalize antigen including IgG (Sallusto et al., J Exp Med (1995) 182:389; Dong et al., J Immunol (1999)163:5427). Uptake of antigen in form of ICs has been shown to promote efficient major histocompatibility complex (MHC) class I and II-restricted antigen presentation and also to facilitate maturation of dendritic cells in a murine system (Regnault et al., J Exp Med (1999)189:371). The key event is the formation of a complex between intravenously administered Oregovomab and the circulation tumor-associated antigen CA-125. Complex formation was confirmed in human PK studies (Noujaim et al., Cancer Biother & Radiopharm (2001)16:187). CA-125 complexed with Oregovomab is taken up uptake by dendritic cell much better than the CA-125 antigen alone (Schultes et al., Proceedings AACR (2001) 42:276; AltaRex Report RT-PRE-011). The xenotypic nature of Oregovomab aids in triggering the release of cytokines (Noujaim et al., Cancer Biother. & Radiopharm (2001)16:187). • Dendritic cells are capable of presenting antigen-derived peptides from extracellular proteins on MHC class I and II molecules. This mechanism of ‘cross-priming’ is very effective when the antigen is presented in complex with a specific antibody (Regnault et al., J Exp Med (1999)189:371; Manca et al., J Immunol (1998)140:2893; Berlyn et al., Clin Immunol (2001)101:276). Intracellular cytokine staining and in vitro antigen presenting assays have demonstrated that Oregovomab-CA-125 immune complexes are vastly superior to CA-125 alone in stimulating IFN-γ secreting CD4+ and CD8+ T cells (Schultes et al., Proceedings AACR (2001)42:276). 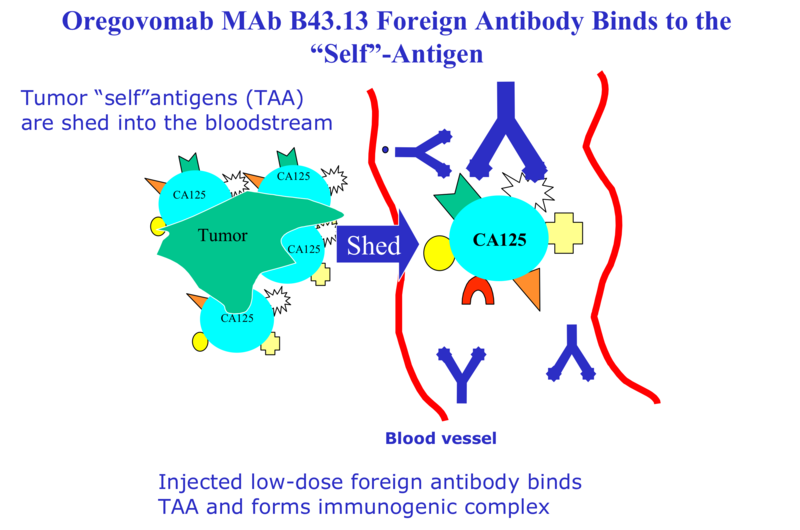 Injection of Oregovomab leads to the generation of human-anti-CA-125 antibodies. These antibodies recognize several epitopes on CA-125 and are of a T cell dependent isotype suggesting recognition of the entire immune complex by the patients’ immune system (Noujaim et al., Cancer Biother & Radiopharm (2001)16:187). Human anti-CA-125 antibodies, induced by the Oregovomab-CA-125 immune complex, have been shown to mediate ADCC and kill CA-125-positive ovarian cancer cells (Schultes et al., Cancer Immunol Immunother (1998) 46:201). Injection of Oregovomab leads to the induction of CA-125-specific T cells (Noujaim et al., Cancer Biother & Radiopharm (2001)16:187). 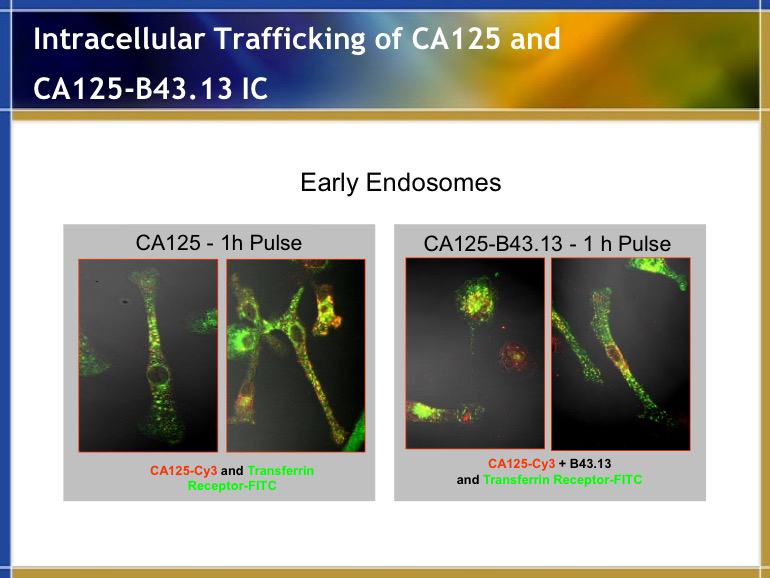 CA-125-specific CTL can directly kill tumor cells. 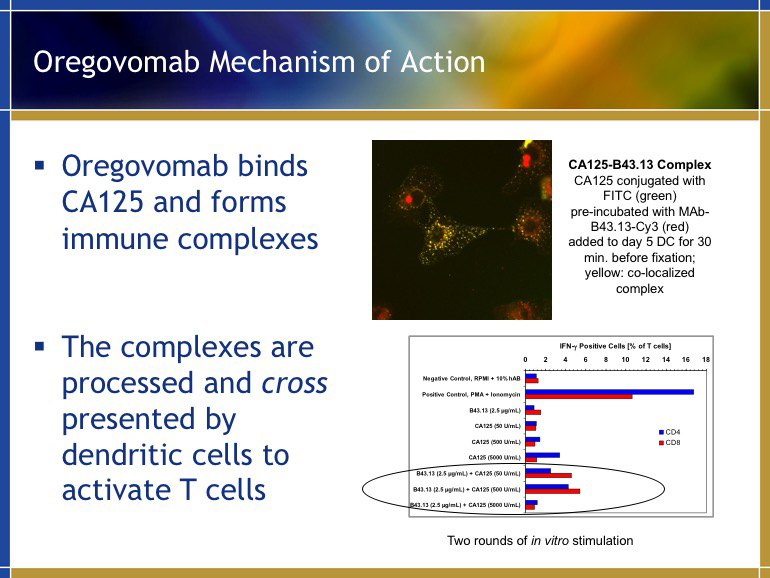 In this context, activated MHC class I (and II) restricted T cells have been demonstrated in patients after treatment with Oregovomab, which respond with IFN-γ production upon stimulation with CA125 and autologous tumor (Schultes et al., Proceedings AACR (2001) 42:276, and Gordon et al., Gynecologic Oncology (2004) 94:340-351). The magnitude and quality of induced T cell immunity to CA125 or autologous tumor is influenced by the timing of Oregovomab infusion relative to other cancer treatments. The combination of carboplatin and paclitaxel can be immune enhancing. (Braly et al., J Immunother (2009) 32:54-65). TLR stimulation in association with Oregovomab and antigen has been found to augment induced immunity in preclinical models (Nicodemus et al., Am J Obstet Gynecol 2010). In addition to oregovomab which targets CA-125, OncoQuest's portfolio also includes antibodies against MUC1, PSA, and Her2/neu, respectively. We have generated clinical data utilizing our CA-125 and MUC-1 antibodies.